By infusing laser-induced graphene, a flaky foam of the atom-thick carbon, with plastic, rubber, cement, wax, or other materials, researchers have created composites with lots of possible uses. 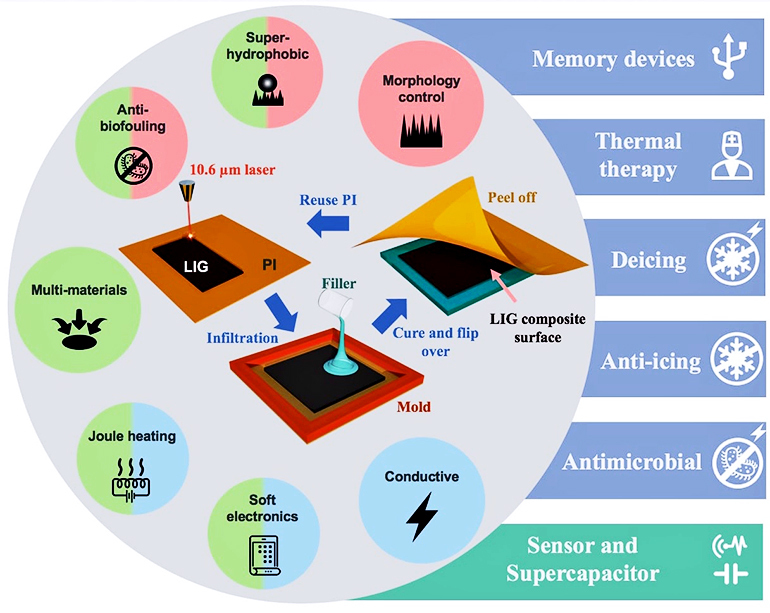 The composites could be useful for wearable electronics, in heat therapy, in water treatment, in anti-icing and deicing work, in creating antimicrobial surfaces, and even in making resistive random-access memory devices. In 2014, the lab of James Tour, chair in chemistry as well as a professor of computer science and of materials science and nanoengineering at Rice University, first made LIG when it used a commercial laser to burn the surface of a thin sheet of common plastic, polyimide. The laser’s heat turned a sliver of the material into flakes of interconnected graphene. The one-step process made much more of the material, and at far less expense, than through traditional chemical vapor deposition. Since then, the lab and others have expanded their investigation of LIG, even dropping the plastic to make it with wood and food. Last year, the researchers created graphene foam for sculpting 3D objects. “LIG is a great material, but it’s not mechanically robust,” says Tour, coauthor of an overview of laser-induced graphene developments in the Accounts of Chemical Research journal last year. To make the composites, the researchers poured or hot-pressed a thin layer of the second material over LIG attached to polyimide. When the liquid hardened, they pulled the polyimide away from the back for reuse, leaving the embedded, connected graphene flakes behind. Soft composites can be used for active electronics in flexible clothing, Tour says, while harder composites make excellent superhydrophobic (water-avoiding) materials. When a voltage is applied, the 20-micron-thick layer of LIG kills bacteria on the surface, making toughened versions of the material suitable for antibacterial applications. Composites made with liquid additives are best at preserving LIG flakes’ connectivity. In the lab, they heated quickly and reliably when researchers applied voltage. That should give the material potential use as a deicing or anti-icing coating, as a flexible heating pad for treating injuries, or in garments that heat up on demand. “You just pour it in, and now you transfer all the beautiful aspects of LIG into a material that’s highly robust,” Tour says. The research appears in ACS Nano. Additional coauthors are from Rice, the Korea Basic Science Institute, the Indian Institute of Technology Bombay, and Ben-Gurion University of the Negev in Israel. The Air Force Office of Scientific Research and the United States-Israel Binational Science Foundation supported the research.